How To Purchase Domain Names: Why Do I need One? How To Purchase Domain Names – Why Do I Need One? If you are serious about succeeding in the online marketing world, having your own domain name is vital to brand your website. When I first started out, I procrastinated to create my own domain name as it seemed to be complicated and I didn’t know the benefits of getting one. I was not sure where to purchase a domain name or what makes a good name. Today I would like to smooth out this step for you. I will walk you through how to purchase domain names and how easy it actually is so that you won’t delay branding your business like I did! Why Do I Need a Domain Name Anyway? 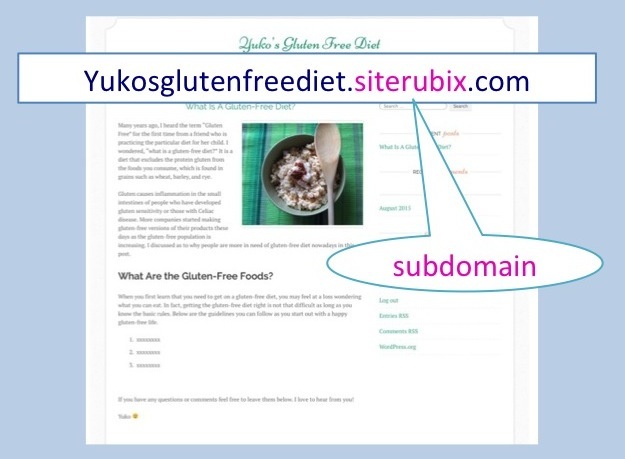 While you are still attempting to shape your website, it is ok to do it on a free website builder that has a subdomain as the one I have below. This is my test site and I do not intend to get it ranked or anything, so I am going to leave it as is. If you are planning on making a successful online business, however, you need to consider getting your personal domain name as it does affect your site recognition as well as SEO. 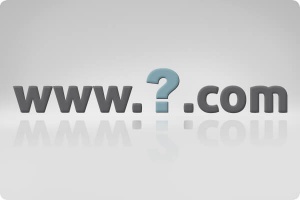 Where Can I Purchase a Domain Name and How Much Is It? There are lots of places you can buy domain names. 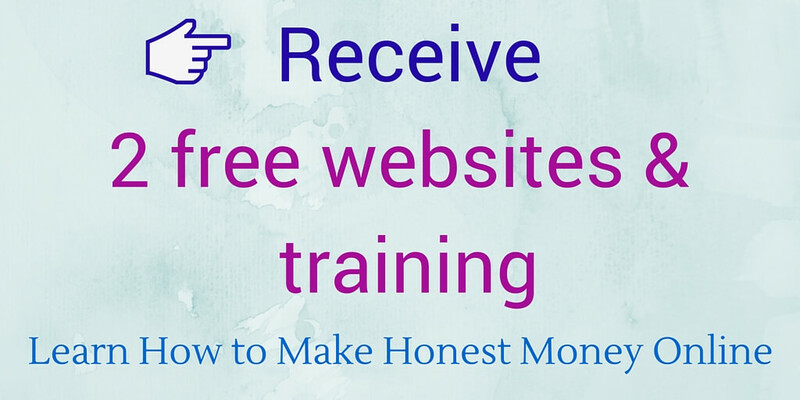 HostGator [AL], 1&1 Domain Names, GoDaddy [AL], and Namecheap are just a few examples. Below is the GoDaddy homepage where you can check the availability of certain domains. Domain names are something that you own. Either it’s “.com” “.org” or “.net” once it’s taken you can no longer buy it. So, you first have to check if the domain name you have in mind is still available. In fact, shorter and easy-to-remember domain names are being reserved everyday, at the rate of one domain name every 5 seconds! Ideally you want a “.com” domain. The second best is “.org.” Any other ones such as “.net” or “.info” would not aid your ranking as well. So I recommend you to focus on “.com” or “.org” for better branding of your site. I typed in “yukoswebsite” in the search bar at GoDaddy just to see if it’s available with “.com” and luckily, it is. 🙂 The result shows that the price is $2.99 for the first two years and $14.99 every year after that. 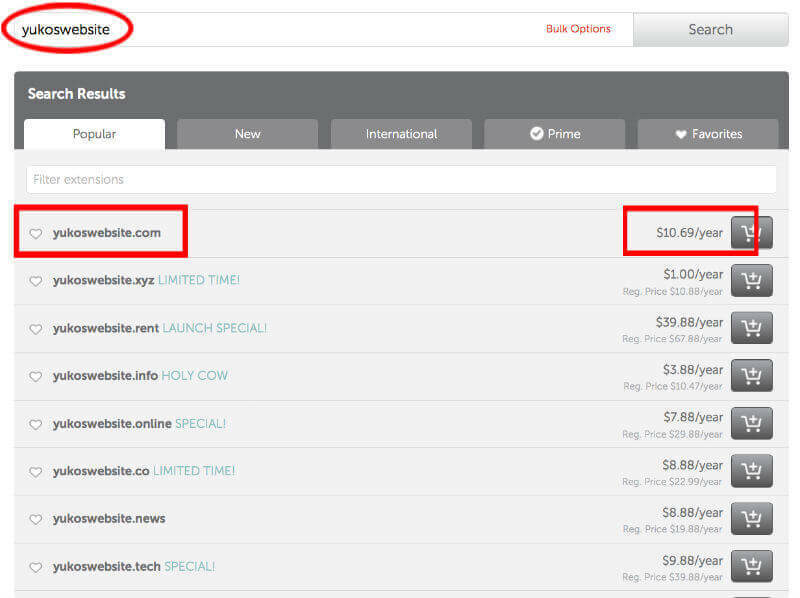 I prefer to purchase my domain names at Namecheap [AL] since the buying process is very quick and easy. They don’t have a lot of upsells in the process, which can be quite irritating. Besides, they tend to have a very good propagation time, meaning that once you set the domain to point over to your web hosting it starts working quickly, within 5-10 minutes normally. 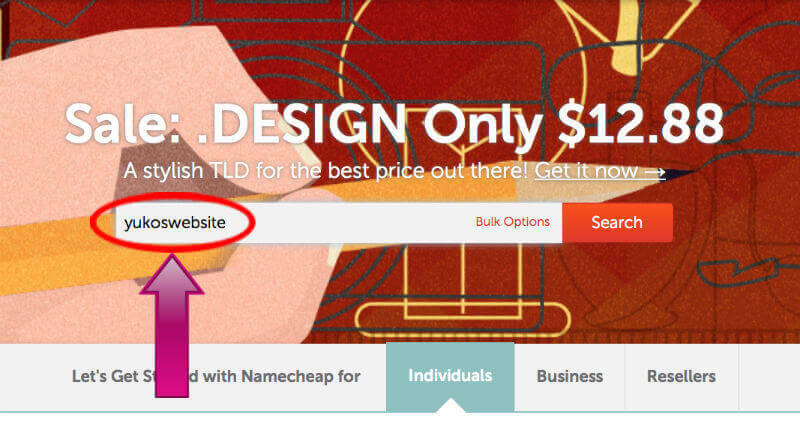 I tried the same domain name “yukoswebsite” at Namecheap to see how much they charge. As you can see, they don’t have the first two-year discount that GoDaddy offered. However, the annual fee of $10.69 will be a lot cheaper than $14.99 in the long run, so for this particular domain I would go for Namecheap. In your real search of a domain name, you can keep trying different phrases in the search bar until you find the one that you are truly happy with. With the example of “yukoswebsite“, I am going to show you every step as to how I purchase a domain name at Namecheap. Once you click on the domain name that you like, it takes you to the shopping cart as below. You can see in the screenshot that the “AUTORENEW” is off by default. I definitely recommend you to turn it on. The reason is that if you forget to renew your domain name manually, you are going to lose the entire website! You do not want that to happen after all the hard work you put into the website. You can always turn the auto-renewal off down the road if you no longer want to keep the domain. “Free WhoisGuard” is what prevents you from getting solicited by scams looking up your information. The AUTORENEW for “Free WhoisGuard” is off by default too, and I strongly recommend to have it on as well. It is free for the first year and from the second year, it costs $2.88 per year. Scroll down the shopping cart page and you’ll see some additional options to purchase as below. These are the only upsells that you will see here at Namecheap. If you do not have web hosting in place, here is one place to buy it. It says $9.88 first year and $38.88/year after that. I would say it is quite average in terms of price. I’ve never had my sites hosted at Namecheap so I am sorry that I cannot speak from experience how their hosting service is. I personally do not need hosting with them as I have all my websites hosted at Wealthy Affiliate. 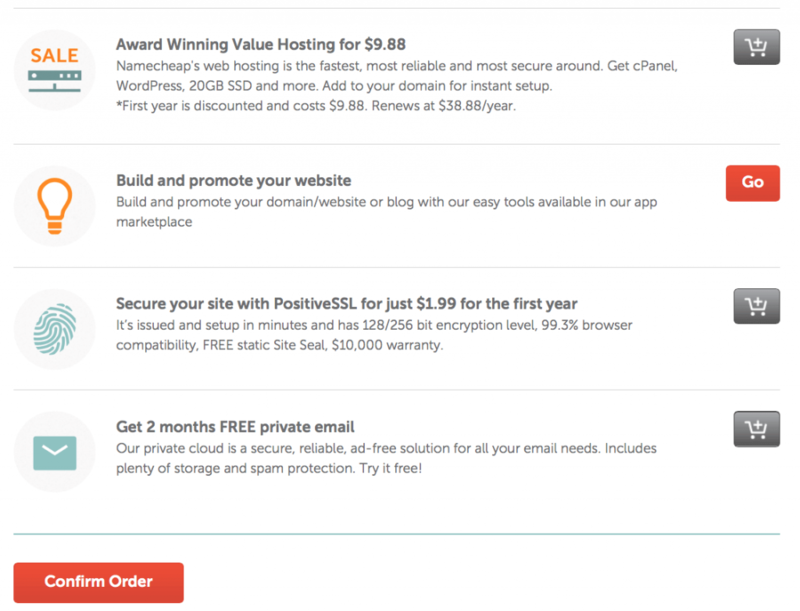 Again, if you do not have a web host yet you can purchase at Namecheap. Other than hosting, I don’t think you really need these additional products. Click “Confirm Order” and continue. 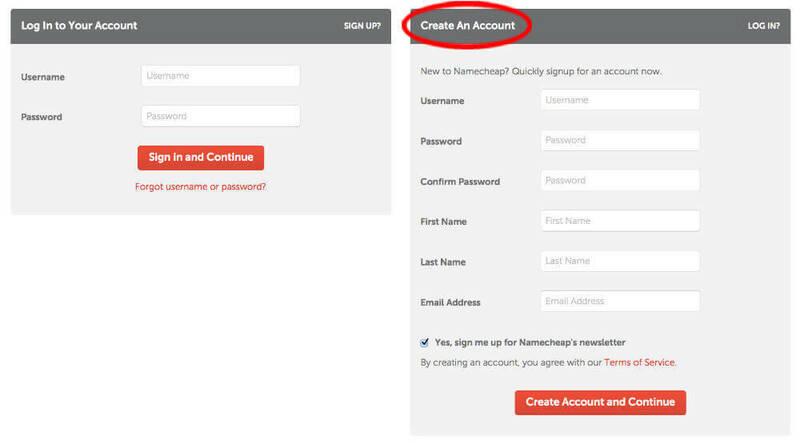 If this is the first time to buy a domain at Namecheap and you don’t have an account with them yet, here you will create one. Having an account with them allows you to access your Dashboard to control all of your domain names registered with them. Simply provide information in the “Create an Account” section. Once you successfully logged in with your account, it will guide you through to complete the payment. Now your purchase of a domain name is complete. Congratulations, it is officially yours! Here are some aspects you might want to keep in mind for coming up with a good domain name. If you enjoyed this article, please “like” and “share.” If you want to share your personal experience with Namecheap or any other domain registrars, please leave them below. I would love your feedback. Thanks! NOTE: There are affiliate links in this article for which I may receive a small commission. The FTC Regulations require me to inform you of this fact so that you are protected from misleading and false claims. I will always be honest with you and indicated each affiliate link as [AL] within this article. I also would like you to know that I will be very appreciative for any commissions I may receive, which funds my business and allows me to write more helpful content for you. Thank you! 18 Comments on "How To Purchase Domain Names – Why Do I Need One?" Great site, you covered everything so well and organized. Makes it easy to understand why I need a domain and more importantly how to pick a good domain. First of all, I love the work you put into your site! It’s very well done! I think it’s cool that you’re a Japanese teacher because I just started learning Japanese 4 months ago! I really like how you provided a breakdown on how to get a domain and getting one is very important, especially that’s unique to your own. I bought mine through namecheap as well and I would like to add that not only that it’s cheaper buying a domain through namecheap but you can also make it even more cheaper for you if you look for discount coupons online before you check out! Pretty sweet right? Konnichiwa, Jeremias-san! Ogenki desu ka? Great that you are learning Japanese! Are you taking a class or learning by yourself? A new quarter has just started at my college and we are starting from “a, i, u, e, o” lol… The elementary level is always so much fun as students improve drastically for a very short period of time! Back to the domain name, I didn’t think about looking for a discount coupons online. That is a great piece of information Jeremias. I should add that to this post and I will definitely remember that for the next time. Thank you! I like your step-by-step instructions set out in your article about getting a domain name. You point out that there can be upsells with other domain websites, and which type of domain (.com, .org, etc) ranks best in the internet world. Your article was easy to read and understand, and I look forward to following your website for more tips! I am glad you found the article helpful and easy to understand 🙂 I first didn’t understand why domain names are important so I figure it would be a useful piece of information for those who are just starting out. How do you buy a domain name? Do you also buy it at Namecheap or do you know anywhere place better? I would love any feedback you can share to benefit readers here. Thank you for dropping by! It is a great information. Sometimes I confuse with my idea to find a domain name for my site. But after I read your article, I got a good idea to find a good domain name for my site. I am going to use step by step guidance to get ranking on Google. I am glad if you can share another idea. But now I’ve realized that it’s important to keep it shorter than longer, and it doesn’t even negatively affect rankings. It is obvious if you see all the very successful websites out there that have only a few words in their domain names. 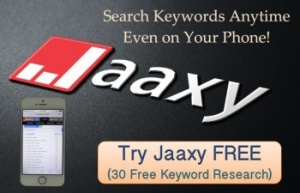 Good luck with your domain name search and I will try sharing more information in the future! Great article about how you can purchase a domain name. Though the process is very simple and easy but some people may not know how to choose a domain, where to buy it or things to keep in mind when choosing a domain. So, I think it’s great that you explain it here. Godaddy is a good choice but they have too many unnecessary upsells and sometimes it may be a little annoying. Anyway you have done a great job by explaining the process. I am personally very happy with Namecheap and have purchased 4 domains already. The process is simple and they were all less than $11/year. As having your domain name is such a crucial part of branding your business, I hope many people do the same for the sake of their online success. This is very good info. I do think now it can almost be better to just get a domain with an easy and memorable name that also reflects the angle you’re looking to use. I used to just put keywords in my domain but ever since Googles updates, it seems that “exact match domains” are not nearly as powerful as they were before. They still seem to work well but I feel that a shorter easier and catchy domain that reflects what you’re teaching really seems to be the new thing. Your domain makes sense and is catchy by adding “Yuko” in front of “online income tips” and is short and easy to remember. I wish I had read this article before naming my site lol. Have you had people ever contact you due to leaving your who is info up? I have actually just left mine and got lucky or just put fake address but not sure if that is a good idea or not. You have any thoughts? I am not sure what you mean by leaving your who is info up? Can you elaborate it please? It is getting easier by the day to purchase a domain name online and they are very cheap. I am also using Namecheap because they are cheap LOL. I cannot remember that well, but I think that Wealthy Affiliate is now also selling domains on their website to make it easier to build a website for newbies? Yes, you are right on that, Viljoen! Wealthy Affiliate has now begun offering domain names too! I think it happened very recently. The services they provide at Wealthy Affiliate are already awesome, and now things will be more convenient for the members as they can get all the basics done within one program. I am happy with Namecheap thus far but will definitely try a domain at Wealthy Affiliate for my next website. I like your blog. It is laid out very well and easy to navigate. There is a lot of content here to read over and you could spend a lot of time here. I agree with you about doing surveys. I don’t believe they are good for earning a living, but if you have time to kill and want to make a little spending money to put towards your cable bill or grocery bill then maybe it would be something to try. Thanks for visiting my website. I hope you found useful information here! I’ve been sharing online income tips and surveys are definitely an option to earn small money without much learning or work required on our sides. For me personally, I just couldn’t spare the time to invest in it. Let me know if there is anything I can help with your online endeavor. Cheers!